a PC and uploading it to a website. Must meet recommended enviroment for respective OS and must have sufficient disk space. 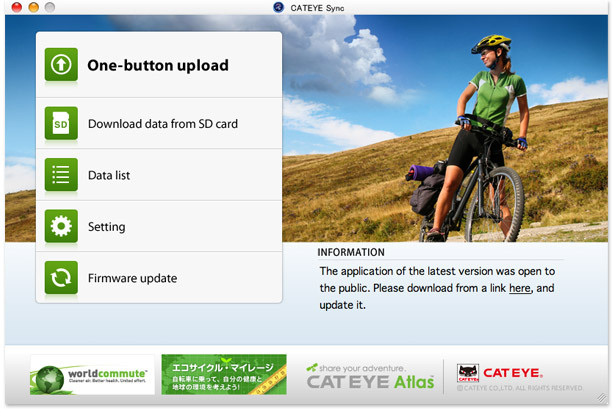 Please do not install this version if you are using the CATEYE Sync with Mac OS X 10.4.x - 10.9.x. Otherwise you may not be able to use the CATEYE Sync after this update. If you are using the previous version of CATEYESync, uninstall it before running the installer. * In Mac OS X 10.8 and later versions, it may not be possible to install the software unless you open System Preferences, select "Security & Privacy", and on the "General" tab, change the setting for "Allow applications downloaded from : Anywhere". 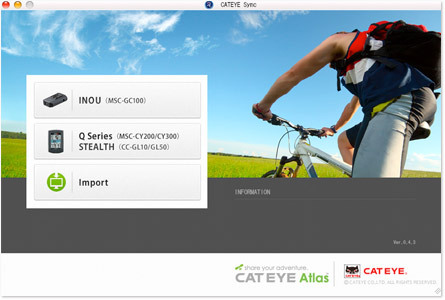 Following the successful download and installation of the CatEye Sync software, we strongly recommend that you return the Security Preferences back to where it was before installation. On Windows (7/8/8.1): Remove the CATEYESync from the [Programs and Features] or [Uninstall a Program] list in the [Control Panel]. On Windows (10): To remove the CATEYESync, open the Start menu and click [Settings] > [System] > [Apps & features]. Select the CATEYESync in the list of installed apps, and then click [Uninstall]. On Mac: Drag the CATEYESync and cateyeAgent folders from the Application folder to the Trash. Then from the Finder menu, select "Empty Trash". If you are using the previous version of CATEYE Sync for INOU™, uninstall it before running the installer. On Windows (7/8/8.1): Remove the INOUSync from the [Programs and Features] or [Uninstall a Program] list in the [Control Panel]. On Windows (10): Open the Start menu and click [Settings] > [System] > [Apps & features]. Select the INOUSync in the list of installed apps, and then click [Uninstall]. On Mac: Drag the INOUSync from the Application folder to the Trash. Then from the Finder menu, select "Empty Trash".